The days of pizza, hometowns and friends are over. There’s a new set of clichés plaguing pop punk, and they’re mostly musical ones, with the same dreary songwriting formula often being used over and over again. It’s not from the stalwarts either, with the likes of The Wonder Years and The Story So Far consistently bringing maturation and originality to the table with every release. The problem lies with the new breed, namely the bands who look up to their successors a bit too much, copying their musical blueprints and hoping it’ll put them on the same winning path. While upstarts Trash Boat try to sell their harder, heavier ‘spin’ on the genre as some kind of USP, one listen to debut album Nothing I Write You Can Change What You’ve Been Through just cements their position as one of pop punk’s copycats. Seriously though, like nearly every new British pop punk band, the majority of Trash Boat’s new record sounds just like Neck Deep. Intentional or not, the similarities really take away from the overall impression – overuse of double time drums (the most irritating characteristic of pop punk), a singer who hasn’t quite learned to control his voice yet in Tobi Duncan and even a two-line cameo from scene overlord / producer Dan ‘Soupy’ Campbell of The Wonder Years fame. Ringing any Ben Barlow or Jeremy McKinnon sounding bells? While there isn’t much in terms of trendsetting here, there are some scrappy examples of keeping trends alive. The two best songs on Nothing I Write You… are the two extremes of the record – heaviest track Pangaea and most pop punk track Second Wind. The former is the only time where the shoutier version of Duncan’s voice actually works, while the latter is perhaps the only track of the eleven which has a shout-back chorus and a more perky vibe. More importantly, the emotion Trash Boat pride themselves on (allegedly) pouring into every song can actually be felt, and it’s hard not to wonder what this album would be like had the others been injected with the same amount of personality. Ultimately though, Trash Boat are still at the ‘playing at being a band’ stage for the time being. They are yet to actually find a sound of their own, the problem being that they have no idea what they want that to be yet. And they’d better decide soon, because it’s sink or swim from here on out. 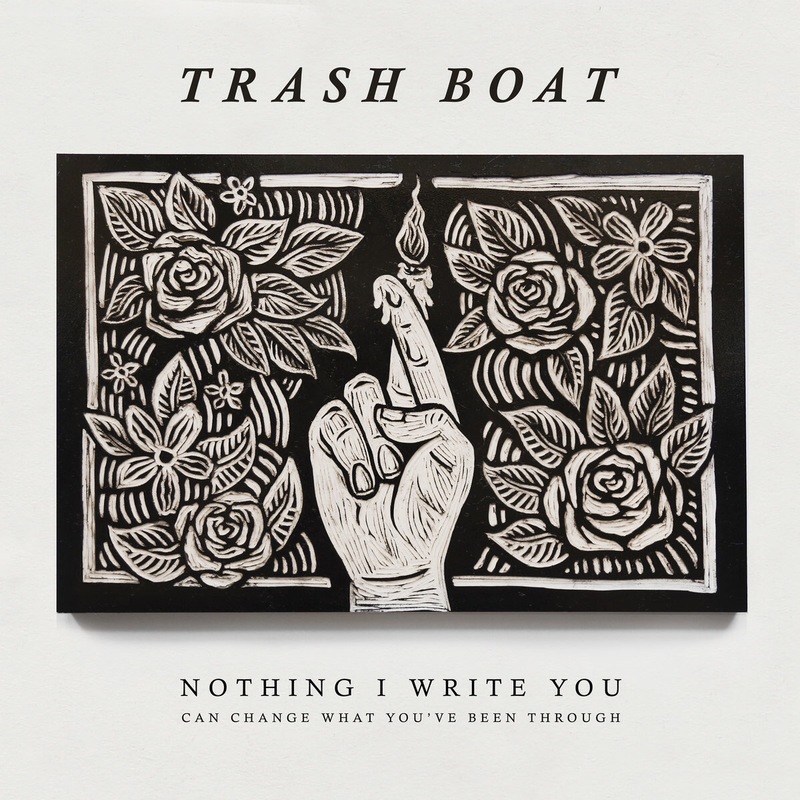 ‘Nothing I Write You Can Change What You’ve Been Through’ by Trash Boat is out now on Hopeless Records.